Apple wants to help you break your iPhone habit. That may sound counterintuitive, but it fits a pattern. From tech to fast food, companies are taking early steps to get ahead of public backlash, the threat of regulation or changing customer tastes. Apple (AAPL) is adding features to its new operating system to help people spend less time with their iPhones. Using a setting called App Limits, you can restrict yourself — or at least try — to an hour a day on Instagram or 30 minutes on Facebook. Google (GOOG) will have a similar feature in its next version of Android. Why would Apple and Google, which make money from smartphone addicts, try to curb your dependence? They are trying to catch potential weak spots in their business models before they mushroom into PR nightmares, or worse. 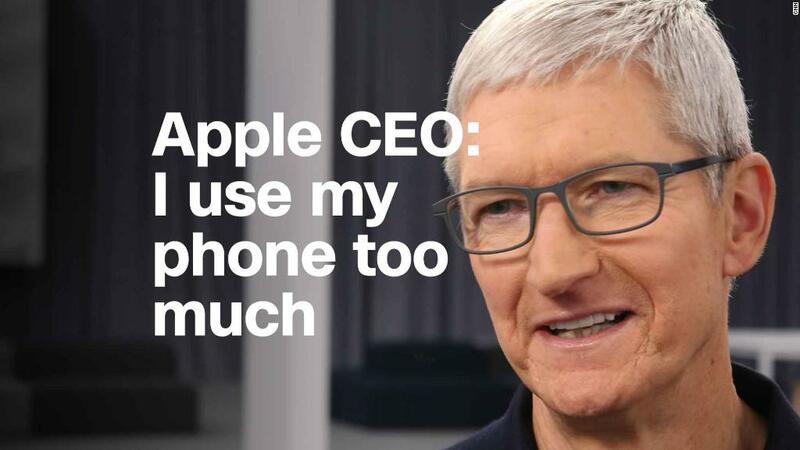 In Apple's case, shareholders were worried about the connection between excessive screen time and mental health. "Businesses need to get smarter about avoiding crises," said Paul Argenti, a professor of management and corporate communications at Dartmouth's Tuck School of Business. Argenti believes companies can avoid most pitfalls by addressing two simple questions: "What are we doing that we shouldn't be doing?" and "What aren't we doing that we should be doing?" Apple sees an opportunity to address a growing risk — tech addiction — and capitalize on your concerns about it. "It's a fantastic strategy," Argenti said. Tech companies aren't the only ones trying to play the long game by making fundamental changes to their products. Pepsi (PEP), Coke (KO) and Dr Pepper Snapple (DPS) are responding to growing concerns about obesity by reducing sugar in their sodas. Fast food chains are making their burgers and fries a little healthier in response. Coke and Pepsi know they have to adapt to stay competitive. Carbonated soft drink volume sales in the United States have fallen 13 years in a row, according to an annual report by the trade publication Beverage Digest. "What's got us to 130 years of success is not going to take us on the next 130 years," Coke CEO James Quincey told CNN's Poppy Harlow in February. McDonald's (MCD) is pulling cheeseburgers out of the Happy Meal and shrinking french-fry sizes. It has been trying to make its kids' meals healthier for several years. Some cities, worried about rising health costs, are already regulating trans fats and demanding more transparency about calorie counts. McDonald's is trying to beat regulators to the punch. Companies are creating environmentally friendly policies, too. Dunkin (DNKN), Coke, and McDonald's are stepping up their recycling efforts, and Budweiser has committed to brewing all its beer through renewable electricity by 2025. They are making changes because renewable energy could be cheaper in the long run, water shortages might become more severe because of climate change, and consumers and employees care about sustainability. CVS (CVS) and Coke were early leaders in working to get ahead of long-term threats, Argenti said. In 2007, Coke announced it would replace the roughly 300 billion liters of water it used every year to produce its drinks. And in 2014, CVS said it would stop selling tobacco. CVS sacrificed around $2 billion in annual sales, but it made sense because the company was trying to reposition itself as a health care leader. At the same time, CVS Caremark renamed itself CVS Health. "By eliminating the sale of cigarettes and tobacco products in our stores, we can make a difference in the health of all Americans," CEO Larry Merlo said when the ban took effect. — CNNMoney's Danielle Wiener-Bronner contributed to this story.